The Accelerated Degree programs offered at Pitt Business put students on the fast track to earning a graduate degree in a professional field. Designed for highly motivated, professionally driven individuals, these programs take advantage of the academic partnerships of the University of Pittsburgh. In addition to saving on the most valuable resource — time — participating students reduce their tuition expenses, gain an advanced degree, and enhance their professional experience. This is another way we take students from the classroom, to the city, to the world. Offered with the Joseph M. Katz Graduate School of Business, the 3+1.5 BSBA/MBA program enables freshmen who enter Pitt Business with at least 15 advanced standing college credits to earn their BSBA degree and a master’s degree in business administration in only four-and-a-half years. 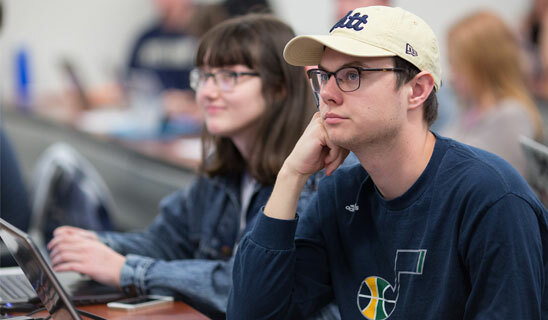 Offered with the Joseph M. Katz Graduate School of Business, the 3+1 BSBA/MAcc program enables freshmen who enter Pitt Business with at least 15 advanced standing college credits to earn their BSBA and a master’s degree in accounting in only four years. Merit scholarships are available to make the cost equal to as if the student was earning only his or her undergraduate degree. Offered with the Joseph M. Katz Graduate School of Business, the 3+1 BSBA/MS-MIS program enables freshmen who enter Pitt Business with at least 15 advanced standing college credits to earn a BSBA from Pitt Business and a master’s degree in management information systems. Offered with the Pitt School of Law, the Accelerated Law Admissions Program (ALAP) allows Pitt Business students to earn their BSBA and Juris Doctorate in a total of six years. Customarily, it would take four years to earn the BSBA and three years to complete law school. To participate, students must apply and be accepted into the School of Law during their junior year in the business school.